I took this picture several years ago when I visited Elon’s majestic campus for Homecoming. It inspired so many personal college memories; in addition, it also was a reflection of my imagination too! 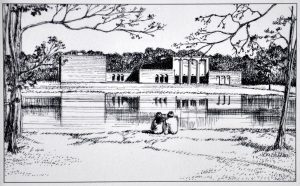 For those of you who have already read Cobwebs of Time, you know the importance of Elon’s campus and particularly the beautiful lake next to Harper Center (in the 1970s) This was the setting for many interactions between protagonists Laura and Brad. Even though the building is different, the picture below is the exact same location. This is the drawing by Kelly Myatt St Clair (www.kellystclair.com) that appears at the end of Reflection of Memories and is also included in Cobwebs of Time. I would love to ramble on about my novels and the significance of the two pictures, but that is not my intention for this post. I want this blog post to focus on memories. Personal memories. Your memories. My memories. Not my fictitious stories. Today, I wish to spotlight real life! When I look at that lovely lake, I have very distinct and personal emotions. It brings back my youth with complete clarity. 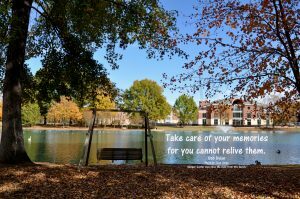 Decades have passed; however, the moment I walk on Elon’s campus and sit by the water’s edge, memories that I have tucked away in the past flare up in my mind’s eye. I see forks in the road and choices I made. I see friendships. I hear laughter. I can even envision old boyfriends — a soft touch, a whisper — a warm hand in mine. I can recall a kiss as if it happened five minutes ago. To my surprise, I feel old hurts and confusion. I feel heartbreak, joy, decisions, challenges and successes. The passing of years does not cloud the memories. Some are beautiful. Others are painful. All are learning experiences that helped create who I am today. When I allow those memories to escape, I am not haunted by unanswered prayers; instead, I am reminded of a fantastic era in my life that gave me an incredible foundation. Is there a place in your past that triggers a multitude of memories? A place where choices were made that changed your life and altered the road taken to your future? If you could relive those memories — would they really be equal to those thoughts you’ve painted in your mind? As Bob Dylan said, “you cannot relive” those memories, but you can learn from them, and those experiences — those memories — can make you stronger. To my fellow Elon Alumni . . . I hope to see you at Homecoming November 2nd and 3rd. Elon.edu/alumni/homecoming Let’s share some of our memories! Yes — I know — we can’t relive them — but we can talk about them and savor the flashbacks! I relive memories all the time. Memories of good moments and sad. And there are many where I know I should have taken a different path or made a different choice but if I had I wouldn’t have learned the great lesson surrounded by that path/choice. Sometimes the bad decisions hold immense value too. I 100% agree with you! Although we enjoy replaying our “good memories” in our minds, we definitely learn more from our failures than our successes. Excellent point, Ali!